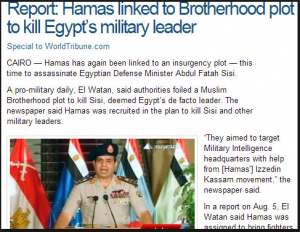 Albawaba News, Published on 16/10/2013, that they obtained recordings between Egyptian Ousted President, Mohamed Morsi and Al-Qaeda Leader, Ayman Alzawahiri. Those recordings show the ties between Muslim Brotherhood and Al-Qaeda Terrorists Organization, after 30/6/2011 when Mohamed Morsi became the President of Egypt. 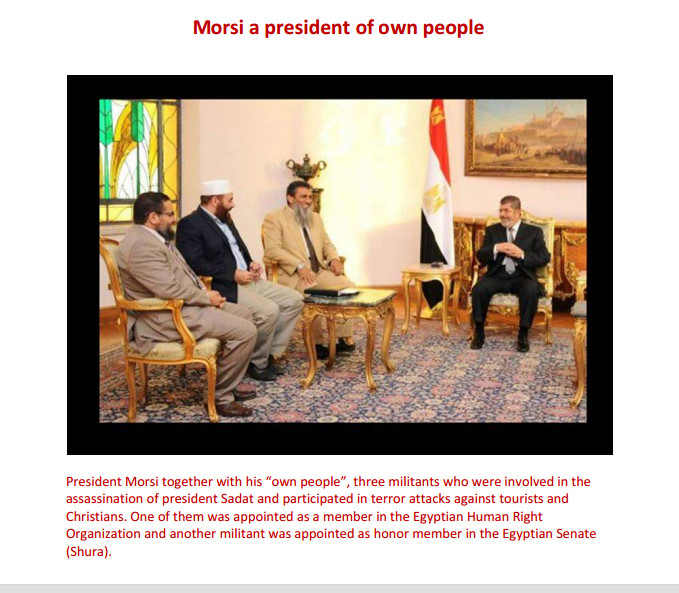 Recordings contain, ousted president Morsi’s promises and commitments to Al-Qaeda’s leader, of not arresting any of the Jihadist or penitential (Extremists Islamist who commit violence under the name of religion), as long as he is the president of Egypt, and his personal permission of opening and setting camps for the training of Jihadist and their loyalists in Sinai. 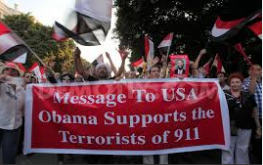 In addition, Sovereign sources in the Egyptian’s State, revealed to Albawaba News, that the nature of communications between the ousted President and Al-Qaeda Leader has exposed the connections and the ties between those communications, and the fact that ousted Mohamed Morsi, gave a presidential pardon to Al-Qaeda leader’s Brother Mohammed Al-Zawahiri who was condemned in many terror acts in Egypt, Emirates and Saudi Arabia. Ousted president Mohamed Morsi, gave a presidential pardon to Mohamed Al-Zawahiri, after the mediation of Rifaa Al-Tahtawy, Chief of Staff of the President of the Republic! Moreover, ousted president promised the brother of Al-Qaeda’s leader, that he won’t be watched by any security authorities in Egypt and he is free to move inside Egypt. Mohamed Alzawahiri, the brother of Al-Qaeda Leader was also a member and a director in the Islamic Relief Organization, the chairman and the board directors and members of that Organization, are Muslim Brotherhood! The first recording call between Mohamed Morsi ousted president and Mohamed Al-Zawahiri, was from the presidential institution, and the call lasted for 59 seconds, Morsi congratulated Al-Zawahiri on his release from jail and he assured him that he won’t be followed or observed by any Egyptian Authorities, because he is the president of Egypt and all the institutions of the country work under his orders and commands. Morsi also talked about the necessity that they both meet soon. 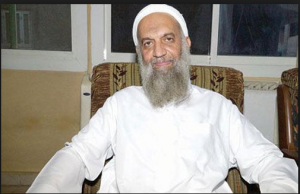 A previous call earlier to that call between Mohamed Morsi and Al-Zawahiri, was between Refaa Rifaa Al-Tahtawy, Chief of Staff of the President of the Republic and Asaad Alsheikha, one of the presidential cabinet members, then Morsi spoke to Al-Zawahiri. The presidential institution continued on communicating with Mohamed Al-Zawahiri on a regular form, and recordings show clearly that Mohamed Al-Zawahiri was the link between the presidential institution and his Brother the leader of Al-Qaeda Organization, Ayman Al-Zawahiri. Another recording expose another call between Mohamed Morsi and Mohammed Al-Zawahiri, which lasted for 2 minutes and 56 seconds, after one month from the date Morsi became a president. Morsi informed Mohamed Al-Zawahiri during their call conversation, that Muslim Brotherhood support Al-Mojahidin (Islamist fighters), and explained the necessity that Islamist Fighters to support The Muslim Brotherhood Organisation, in order to succeed in ruling Egypt. Mohamed Al-Zawahiri congratulated Morsi for winning the presidential elections, and he expressed his happiness that Morsi’s won that presidential elections, which personally means to Al-Zawahiri, that secular infidels will be totally removed from Egypt. Then they both discussed the necessity of Islamist putting their hands on all the joints of the Egyptian State, like the example of the Iranian regime. In that call, Al-Zawahiri confirmed to Morsi that if he rules Egypt according to what God ordered him, and not according to this called “Democracy”, and to get rid of all his opponents, he can assure him then, that all Al-Qaeda Organisation do support the Muslim Brotherhood Organization. Al-Zawahiri also showed his happiness and satisfaction about the regular communications and contacts between Muslim Brotherhood International Organization and Al-Qaeda Members. After that specific call between Al-Zawahiri and Morsi, other many direct constant calls were recorded between Kairat Al-Shater the second man in the Muslim Brotherhood Organization and Mohamed Al-Zawahiri, and many meetings were held between Al-Shater and the Brother of Al-Qaeda’s Leader. Another call was recorded after one month and a half from the previous call between Morsi and Al-Zawahiri, revealed the common cooperation between the presidency institution and the Muslim Brotherhood from one side; and Al-Qaeda on the other side, in order to create Cells from Al-Qaeda inside the country, to protect the Muslim Brotherhood regime inside Egypt. Al-Zawahiri told Morsi in that call conversation, that he was not happy with Morsi’s regime, who is not applying the Islam Sharia Law (rule according to the religion) as it should be and he criticized the Brotherhood and Morsi’s Government for not taking that applying of Sharia Law seriously as they agreed on. Morsi responded to Al-Zawahiri’s criticism by saying that the Muslim Brotherhood will apply Sharia Law and legitimacy according to what it is subject of satisfaction to the Muslim Brotherhood, which is according also to Al-Zawahiri’s request, but the reason it is not applied yet, due to the current stage of Controlling the State’s joints first, and in order to succeed in controlling the country, the Muslim Brotherhood need all the support they can get from all concerned parties. Morsi added, that right now, they can not apply the Iranian regime or the Taliban Regime in Egypt, because it was not the right or the proper time to do that. Al-Zawahiri asked Morsi that it is necessary that he releases all the Gihadist (Islamist extremist fighters) from jails, and he told Morsi, you are not going to let those honorable Gihadist in jails, who got sentenced during Mobarak’s regime, because jails are not the right place for the Gihadists. He added to Morsi, that if Morsi and the Brotherhood want to turn the old page and start a new one, they must show Al-Qaeda, some good intentions, in releasing all Islamist prisoners from Jails, as a guarantee for the good intentions and the start of Islamist new Era. Morsi’s reply to that was that he will do his best, in facilitating the return of his Brother, Ayman Al-Zawahiri, the leader of Al-Qaeda Organization to his home Egypt, where he belongs. After that call, a sovereign source confirmed, that a list was sent to Mohamed Morsi addressed by Mohamed Al-Zawahiri, after coordinating with his brother, the leader of Al-Qaeda Organisation, which contain names of dangerous terrorists Groups elements in Egyptian jails, who were condemned with terror acts, and sentenced with severe courts sentences. Mohamed Morsi, approved all the names stated in the list and issued official presidential Pardon and ordered all concerned authorities, by the power of law (his authorities then were above all laws) to release all names from Jails immediately. After the release of the terrorists elements, two calls were exposed between Mohamed Morsi and Mohamed Al-Zawahiri. Mohamed Morsi confirmed in those two calls, that none of those released elements will be chased by any authority in Egypt, because as he confirmed to Al-Zawahiri before, that he is the president, and all institutions in the country work under his commands and orders. Morsi also confirmed that he will make sure that no authority in Egypt will chase or follow any Islamist elements in Sinai and they can move freely, and the presidential institution will always have constant communications with Al-Zawahiri to make sure that every thing work according to their agreement. Al-Zawahiri asked Mohamed Morsi, that they need to have training camps in Sinai in order to support the Brotherhood, through their trained militants. Morsi replied, that the Muslim Brotherhood intend to form a revolutionary Guards in order to protect him to remain in his post, against any coup that may take place against his legitimacy. Morsi asked Al-Zawahiri, for Al-Qaeda’s support to the Muslim Brotherhood elements and loyalists, and also in training Muslim Brotherhood elements. He also promised Al-Zawahiri, that he will allow them and facilitate for them to have their training camps in Sinai and also to provide all facilities for Al-Qaeda’s elements on the Egyptian Libyan Borders. Sovereign Source confirmed to Albawaba News, that indeed, Morsi did as he promised Al-Zawahiri, and managed to provide 4 training camps for the Gihadist elements (Islamist Fighters). Mohamed Morsi was then the Chief in Command of the Egyptian Military Forces, and with this Power of Authority, he stpped the Egyptian Military to stop any missions or operations in Sinai against any Islamist Elements, despite that Morsi knew that Sinai was full of Al-Qaeda Elements already. 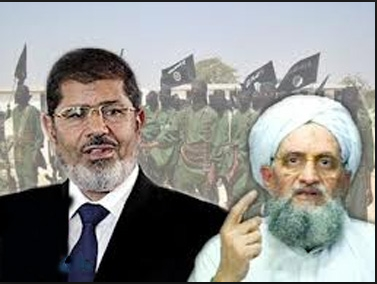 Mohamed Morsi and Al-Zawahiri, both fulfilled their commitments to each other’s Organisations, Brotherhood and Al-Qaeda, and created militants from Islamist to defend the Muslim Brotherhood regime inside Egypt. Before Mohamed Morsi’s visit to Pakistan, Morsi had another call with Al-Zawahiri and promised him to meet each other before he travels to Pakistan. 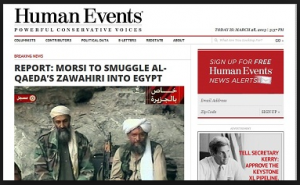 But Morsi was not able to meet with Mohamed Al-Zawahiri because his schedule was so busy. After Mohamed Morsi reached Pakistan, and during his visit, he had a meeting with the Leader’s of Al-Qaeda Mediator. That meeting was held in a hotel in Pakistan and lasted for one hour and a half, then he talked on the phone with Al-Zawahiri for 43 Seconds, and both confirmed the mutual support between both Organizations: Al-Qaeda support to Muslim Brotherhood Organisation, and Muslim Brotherhood Organization’s support to Al-Qaeda. After Morsi returned to Egypt from his trip to Pakistan, he issued another new list with Presidential Pardon which contained 20 terrorists elements names, considered dangerous to the national security of the State. Despite the National Security and the intelligence warning and reports about those dangerous elements, which recommended that those elements can’t be released for the national security of Egypt, Mohamed Morsi disregarded and ignored those warnings and reports, Mohamed Morsi released them with a presidential Pardon. 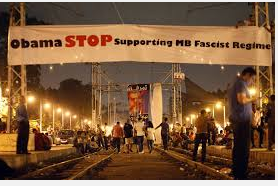 Sovereign source confirmed that The Muslim Brotherhood International Organisation provided 50 Million Dollars to Al-Qaeda Organization to support the Muslim Brotherhood Regime in Egypt. The Last call recorded between Mohamed Morsi and Mohamed Al-Zawahiri, was on the dawn of 30/6/2013 (date of the Egyptian revolution), that call was made by Mohamed Morsi to Al-Zawahiri, at the presence of Asaad Al-Sheikha, the Deputy Chief of the Presidential staff, Refaa Al-Tahtawy, the Chief of presidential Staff, and the security responsible of the Presidential Institution. At the same day, Asaad Al-Sheikha, the Deputy Chief of the Presidential staff had a meeting with Mohamed Al-Zawahiri and give him a message from Mohamed Morsi the ousted President, in which Morsi was asking Al-Zawahiri to oppress and stop those demonstrations and his opponents in any way. The details of the last call between Mohamed Morsi and Mohamed Al-Zawahiri: Morsi incited Mohamed Al-Zawahiri against the Egyptian Military Institution in Sinai and asked Al-Zawahiri to support the legitimacy of the President and added that there are people out there, who want to make a coup against the legitimacy, and that Muslim Brothrhood opponents must be eliminated. At the end of their conversations, Mohamed Morsi told Al-Zawahiri that he must ask all the Gihadist and the loyalists from every where, to help Muslim Brotherhood regime. 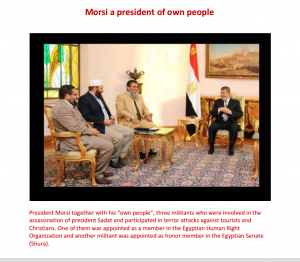 In the meantime, Mohamed Morsi gave a signal to all terrorism operations to start moving in Sinai, later on after he got isolated, Al-Qaeda Organization announced that they are not going to allow the falling of the ousted President, and declared war against the Egyptian Military. At the same day of 30/6/2013, Kairat Al-Shater the second man in Muslim Brotherhood Organization, had a meeting with a delegate of Gihadist (Islamist Fighters) with the attendance of Mohamed Al-Zawahiri. Al-Shater confirmed and repeated the Muslim Brotherhood Organization’s request from Gihadist to support the Presidential institution and the Brotherhood organization, to stop any earlier falling of the President. Mohamed Al-Zawahiri promised Al-Shater that they will make sure that there won’t be an earlier falling.